Franklin Monroe-MVCTC FFA freshmen members Bradley Rumble, Zach Wilson, Mason Garber, Colton Beatty and Mitchel Schmitmeyer display some of the poinsettias grown in the Franklin Monroe greenhouse this fall. 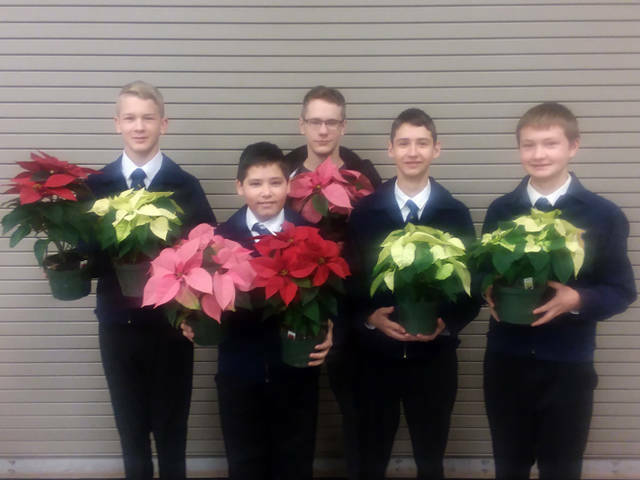 PITSBURG – The Franklin Monroe-MVCTC FFA is selling poinsettias that it grew this fall. The Franklin Monroe-MVCTC FFA chapter brought in a small shipment of poinsettias on Oct. 13. The animal and plant science classes have taken care of and nurtured these plants so that they are ready to be sold for Christmas. To prepare the greenhouse for the poinsettias, Xavier Gilliland and Jacob Aslinger assisted Adviser Kevin Bergman in setting the computer system up for the appropriate climate. Students in the plant and animal science classes assembled the irrigation system to ensure that the plants received appropriate water and nutrients. The system was designed to give each plant the necessary water and fertilizer at the appropriate time. Individual irrigation drips are placed in each of the plants. This slow watering prevents over-watering and also prevents leaves from getting too much moisture on them, which can cause discoloration. Students discussed and investigated the three major macronutrients necessary for proper plant health. After determining the nutrients that are required, the students formulated the proper fertilizer to deliver these nutrients to the plants. They utilized a Dosa-Tron fertilizer system to accurately fertilize each plant. Along with watering the plants, the students visually inspected the plants to ensure proper plant health. All of their hard work has paid off as the students now have poinsettias that are ready to be sold to the public. This project has proved to be a valuable learning experience as the students have learned about plant health and nutrition. Not only did they learn about plant systems, but they also learned about sales and marketing. These poinsettias are now available to the public for purchase. The poinsettias are $8 each or four for $30. Anyone who is interested in purchasing some poinsettias should contact the Franklin Monroe High School office at 937-947-1328 and ask to speak to Bergman.